I enjoy the Michael Bay movies. There. I said it. However, with each movie, I make an empty promise to not buy as many of the toys this time around. Of course I break that promise every time. Usually what leads me to break that promise is a sense that I have to complete a line or I really like the characters design. This time my motivations were a little more childish and petty. It was Christmas Day and my cousin’s young son had a Transformer that I didn’t. That was unacceptable to me so I sought one out. 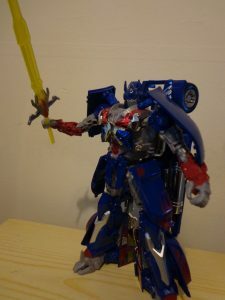 Lo and behold, no more than a week later, I held in my hand Age of Extinction Leader-Class Optimus Prime. And I have to say, in-hand he looks a lot better than he does in pictures. Sure, he has the same issues but some things just look better when they’re right in front of you and this figure is one of them. One of the things that always struck me about this figure is the new alt-mode. 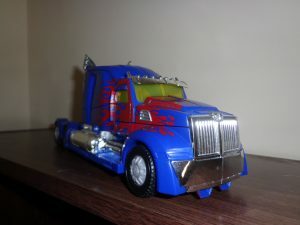 In Transformers: Age Of Extinction, Prime scans a Western Star 5700 truck and adopts it as his vehicle mode. It’s such a unique looking truck and represents a sleek new look for the character. I simply had to have it. The most surprising thing about this Prime is the amount of chrome on the toy. The front grill and the smoke stacks are such nice shiny silver. On top of that, the blue plastic appears to be glittery. It gives the character a metallic appearance that really makes him stand out. If nothing else, Hasbro have upped their game on the materials here. As with most things designed to roll, the truck traverses smooth terrain quite nicely on six chunky wheels. The striking thing here is that the tires are made out of a softer black plastic than the rest of the wheel. At first glance I thought they’d used rubber tyres but, alas, no. 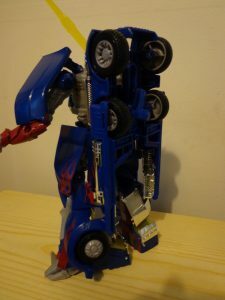 Even so, making the tyres a separate piece from the main wheel is a rare move in modern Transformer manufacture and I can really appreciate that dedication to detail. There is also some weapon storage to boast about. 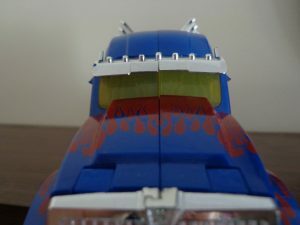 Prime’s sword has a place to sit on the undercarriage of the truck mode. His shield can be placed on the back of the truck. The result is great for the sword as you can’t see it but the shield looks a little awkward back there. It has to be said that using yellow semi-translucent plastic for the windshield was an odd decision. It’s similar to the plastic used for the sword and it just looks strange on an otherwise fairly realistic looking truck. I’d be lying if I said a few more paint applications could’ve improved an otherwise decent truck mode. In particular there are some surface details that could’ve popped with a little bit of colour to emphasise them. As it goes, the details are wasted as you can’t see them in a sea of blue plastic. Transformation reveals what I suspected when I first saw the panel lines on this guy; he’s mostly a shell former. It’s a case of moving panels out of the way and unfolding the robot inside. I can forgive this for the most part because the designers have at least attempted to incorporate the panels into the robot mode. The side panels become skirt armour, while the top of the truck becomes shoulder armour. This goes a long way toward reinforcing the knight aesthetic that Prime has adopted in his latest iteration. The trouble is; it limits poseability. The arms fold out from the centre of the cab and once cleared out of the way, the chest panel flips down and clicks into place which reveals the only piece of ‘mech-tech’ that this figure has going on. 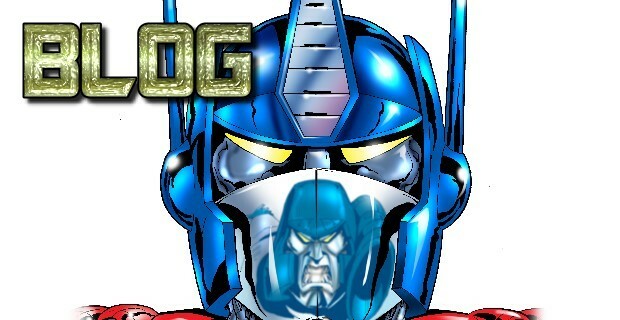 The head pops up out of the chest cavity. I’m personally thankful for that feature as the alternative would’ve been an unwieldy lever or having to yank the head out yourself. Normally that wouldn’t bother me, but with this figure, it could lead to scratching the paint or damaging the head by yanking it up. The legs represent the most interesting part of the transformation, in my opinion. The entire nose section of the vehicle folds out into a pretty sturdy pair of legs. The top of the nose and the front window section become some pretty heft calves with the feet folding out from underneath to complete the look. Once he’s all folded out and looking considerably more Optimus-like, he’s actually a fairly decent robot. He’s not without his drawbacks, which I’ll get into shortly, but he cuts a pretty imposing figure. Articulation on the figure is better than most, though somewhat hampered by the various panels hanging off of him. The majority of his joints have nice strong clicky ratchets that make posing him a joy. If only they could be a little more consistent in their use of ratchets, particularly in leader-class figures, Hasbro might be able to avoid the loose limbs that plague the otherwise excellent Titans Return line. One of the areas where this toy falls down is the sheer amount of kibble on display. Of particular note is his huge backpack. It’s essentially the entire back-end of the truck at a ninety-degree angle and work as a ruck-sack. That was one of the things that put me off about him when I first saw the promo images. It just looks silly. They’ve tried to make it at least a little functional by having the option to store his sword on his back but it doesn’t do anything to make it look less ridiculous. When it comes to the paint-work on the robot mode, as is often the case with Hasbro’s standard retails releases, it’s a little lacklustre. Besides the chrome, there are only really three colours on this figure. 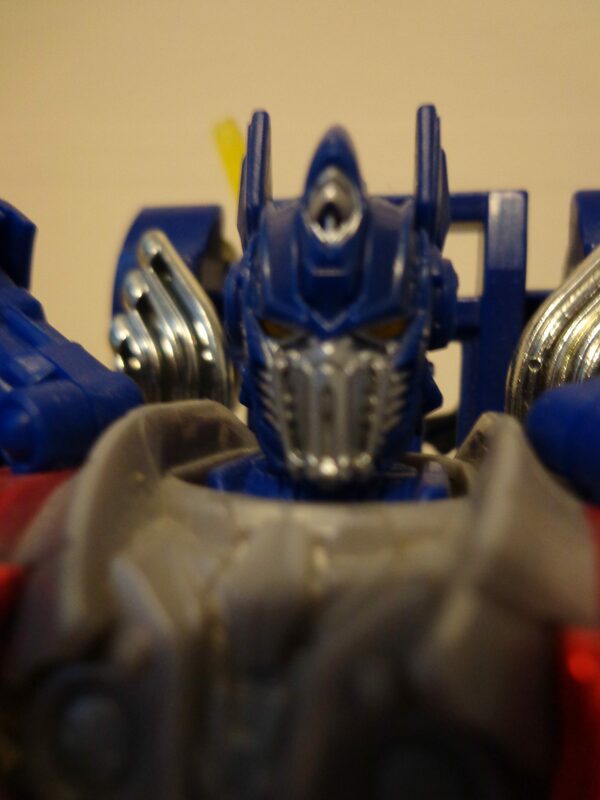 A little more detail might have been enough to offset some of the negative aspects of the robot-mode. Overall, as much as I dislike how over the top the kibble is, I can’t help but like this figure. He could definitely benefit from more detail but the combination of a badass truck mode and a very sturdy robot makes him worth a punt if you can find him at less than retail price.